A new organization and community effort has stepped up to address a problem that has become far too prevalent in Charlotte (as in many other cities and towns across the country): too many misguided/unguided, young black males. 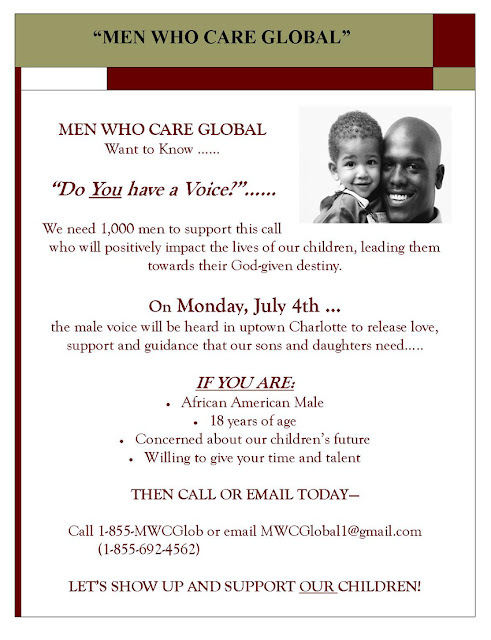 Men Who Care Global has recently launched, and in response to the violence and uncivil disobedience that occurred on the Saturday night of Memorial Day weekend in Uptown Charlotte, they're rallying around the upcoming Fourth of July celebration. If you aren't familiar with what took place exactly one month ago today, seventy people were arrested in Uptown the night of May 28, mostly young black males, and even worse--a 22-year-old was shot and killed ("Tension rose for hours before melee, police say"). Some have blasted the media for their portrayal of the incident, saying that the published stories and newscasts exaggerated the level of chaos that actually took place. I say, if your focus is on how the media covered it, you're partly the reason we as a society can't solve our most troubling issues. I don't shoot the messenger, because we have too many actual shooters, too much gang activity, too much drug-dealing, too much violence in the black community and not enough people willing to do anything about it. Looks like Men Who Care, whose mission is to "positively intervene in the lives of young African-American males through spiritual, physical, mental, emotional, and financial knowledge transfer..." is attempting to do something about it. The organization is trying to pull together 1,000 black men who'll be a positive presence in Uptown on July 4. Organizers say they're doing this because they recognize that "adult male presence where young people congregate is a deterrent to disorderly behavior." And in describing the objectives of Men Who Care, they state: "We believe that men are the problem; we believe men are the solution." Anyone who knows me personally knows I don't mince words when it comes to this topic. Aside from my mentoring of youth, I try to support positive causes whenever I can, including often on this blog. A couple of weeks ago, I vented my frustration on Facebook: "I'm still waiting on the Facebook pages and Twitter hashtags... Or did I miss them?" The Men Who Care website has recently gone up at www.mwcglobal.org, and I'm presuming more content will be added soon. They're holding a press conference tomorrow (Wednesday, June 29) at 11:30 a.m. at the Charlotte-Mecklenburg Government Center, 600 E. Fourth St. And a prep-session is scheduled for July 2 at West Charlotte High School. For more details, call 1-855-MWCGlob (1-855-692-4562) or email MWCGlobal1@gmail.com. If you need a visual as to why it is important that the community supports this cause, watch the video below that CMPD released of surveillance of Uptown on the night of May 28. We have to do a better job leading our youth. tonight made an impact on our youth.so do not this be short lived w.w.